This movie is Hilarious!! 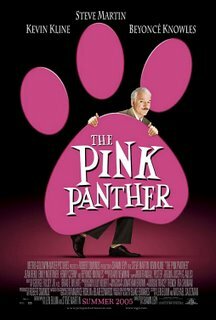 I wasn’t that keen to watch this movie in the first place, as i’m not really a big fan of the Pink Panther. Almost 90% of the movie is set in romantic Paris/France. There’s scene where you can see a very nice eiffel tower with blinking lights. The whole cinema was roaring with laughter watching Steve Martin’s comedic antic, especially his french accent. He had a string of comedies under his belt so acting out Inspector Jacques Clouseau would be a breeze. Without him, the movie would a bland little drama. As i expected, Beyonce Knowles is just the “fa chun” or pretty vase in the movie. Don’t see the purpose of promoting her big name as her scenes are very few. Look out for the dancing scene near the end of the movie, that’s where i laugh the hardest. Exacty what i needed! hahahaha. It’s sooo funny, to see 2 almost elderly man dancing and frolicking in body hugging suits. It’s a 5/5 rating for comedy movies from me definately! Go Watch this as well.